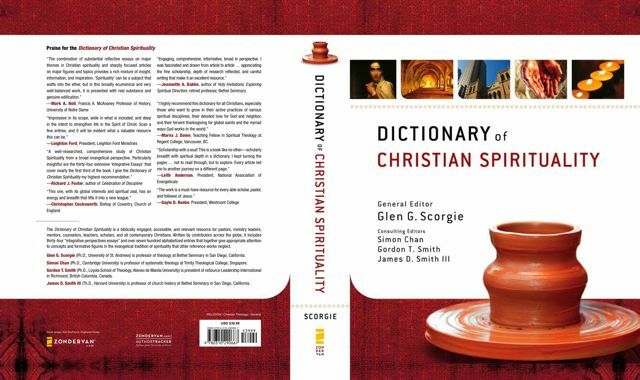 Zondervan publishers has just released the hardbound Dictionary of Christian Spirituality. After four years of effort, we are delighted to see this unique volume finally in print. It is a biblically engaged, reliable and accessible resource for contemporary Christians. Writers from across the globe have contributed thirty-four “integrative perspective” essays and nearly seven hundred alphabetized entries. Together these offer a discerning orientation to the wealth of ecumenical resources available today while still highlighting the distinct heritage and core grace-centered values of classic evangelical spirituality. This volume has been a collaborative effort. I am especially grateful to our three consulting editors—Simon Chan, Gordon Smith, and Jim Smith—for their wisdom, scholarship, global and historical perspectives, and faithful commitment to this project. For the last two years or more, this trio has weighed in via email form all over the world—Oxford and Hanoi, Bangalore and Nairobi, Manila and Pittsburgh. In many instances, they pointed toward neglected literature, refined draft statements, and preempted serious gaffes. They have enriched the content of the volume in countless ways; the task simply could not have been completed with anything near the same quality without them. Eventually the volume attracted over two hundred contributors—women and men, and the whole representing the inhabited contents of the world. We feel gratified that this group encompasses the full spectrum of Protestants, including Calvinists and Wesleyans, Episcopalians and Anglicans, Pentecostals and Baptists, Seventh-day Adventists and Dispensationalists; also some Roman Catholics and Eastern Orthodox; and even a few who are not going to church at all right now. Eventually the book grew to 852 pages and over a half million words. Despite its substantial size, it is being offered for the very accessible price of only $39.99. And even further discounts are currently available on orders placed through Amazon or Barnes and Noble online. As editors and writers who have made substantial investments in this volume, we naturally hope that it will be well received and favorably reviewed. Positive response from people “in the know” will naturally be most welcome. But deeper down, I think we identify with the great American theologian Jonathan Edwards, who resolved fairly early on in his own career to be “useful rather than conspicuous.” We are hopeful that the volume may influence the understanding—and even more importantly, the actual dynamics—of Christian spirituality in many churches, colleges, and seminaries for years to come.